Anyone read the latest issue of ESPN: The Magazine? If not, you've missed a multi-page spread (with full-page photo) on the tortured life of Jeannette's own Terrelle Pryor: the recruiters, the endless text messages, the flood of autograph requests in the mail...and a couple of paragraphs about an autograph hawk called "J-Fed Authentics" who traveled four hours to successfully nab Pryor's signature on a variety of items, including a used wristband. 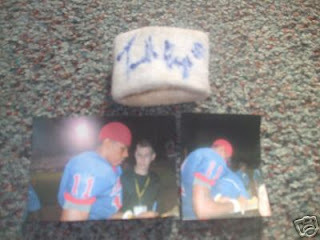 The Terrelle Pryor Game-Used, Autographed Wristband. Blurry photo proof not included. That ESPN story wasn't lying about J-Fed scooping up multiple signatures from the most famous Pryor since the star of Brewster's Millions. J-Fed also offers a signed basketball, signed 8x10 photo, and signed piece of floorboard, all ranging in price from $60-$100. If someone's really willing to fork over $100 for a signature from "The Next Vince Young", I'd be shocked and surprised. By the way, is calling someone "The Next Vince Young" still considered a compliment? J-Fed's not the only eBay entrepreneur trying to ca$h in on Pryor. 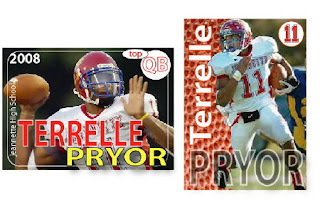 A seller known as swtoyogist is offering homemade trading cards of Pryor, among other amateur players. Any Pitt fans looking for limited edition Joe Flacco, wondering what could have been, you're in luck. So the Terrelle Pryor market, limited as it may be, appears to have some activity. This story harkens back to the amateur days of Lebron James, with the rare exception that a trading card company never distributed an uncut card sheet of Pryor and other stars during a game, causing a near-riot that night. The sheets, featuring Lebron, Sebastian Telfair, and other high school hoopsters, were selling for up to $200 shortly afterwards. Think of it like when the Pirates give away a bobblehead, only this was a freebie that people actually wanted...unlike this, which is probably considered the worst giveaway in the history of professional sports. J-Fed needs to put a new spoiler on his Honda Civic. Flacco actually went on to have a fantastic career at the University of Delaware after transfering from Pitt. Flacco was also pictured in ESPN the magazine recently as a standout player from a D2 school. I bet Pitt wished they had Flacco this season.